When you open your book at the beach this summer, chances are good that you’ll be “on the same page” as the person in the next beach chair. Chester, Deep River and Essex residents of all ages are being given the first-ever opportunity this summer to participate in a community read of “Three Cups of Tea” or its companion books for young readers. The goal of this summer’s “On the Same Page” community read, sponsored by the Healthy Communities ∙ Healthy Youth initiative, is to change that. Funded through Middlesex United Way, the Healthy Communities ∙ Healthy Youth initiative in Chester, Deep River and Essex focuses on building youth developmental assets (the building blocks or ingredients for a young person’s success). “The more assets a young person possesses, the more likely he or she will be emotionally healthy and successful in life.” The feeling of community – having a caring neighborhood, other adult relationships, positive family communication and support – is one essential component of these developmental assets, according to the Asset Development Strategy Team, which is leading the Healthy Communities Healthy Youth efforts. 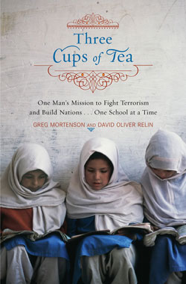 For those of you who don’t know the book, “Three Cups of Tea” is the true story of mountain climber Greg Mortenson, and how he has changed the lives of 58,000 school children (many of whom are girls, otherwise denied schooling) in his quest to bring education to Pakistan’s and Afghanistan’s rural villages. He started the work after his 1993 attempt to climb Pakistan’s K2 mountain. After becoming separated from other climbers in his group, Mortenson ended up in a village where he was cared for by the residents. During his recovery, he noticed the children did not have a school building or any learning materials and that they used sticks to write their lessons in the dirt, and he vowed to return to build them a school. The Asset Development Strategy Team (made up of Dr. Ruth Levy, Phil Miller, Rev. Tim Haut, Mary Hambor, Gail Onofrio, Laura Kasprow, Marjorie Russell, Jane Cavanaugh, Gina Sopnewski, Barbara Vandehei, and Justyna St. Onge) says, “We would like to invite you to participate in whatever way you would like – from reading the book with your child – to helping us create meaningful experiences around it – to participating in those experiences.” Discussion groups for the book are being arranged for each of the towns this summer. Anyone who wants to offer a place for a discussion group is asked to contact Gail Onofrio at Tri-Town Youth Services (860-526-3600) by June 30. Some groups will be for adults, some for families. The committee is also trying to establish a blog so people can “discuss” the book from anywhere this summer. Options for a culminating event in October and doing something with Pennies for Peace are still being considered. DEEP RIVER— Valley Regional High School awarded diplomas to 137 seniors in the Class of 2010 under picture perfect skies Friday at the school’s 59th annual commencement ceremony. A crowd of hundreds of family and friends gathered on the southeast side of the school grounds to watch the graduates from Chester, Deep River and Essex, along with the school faculty, march down the aisle to the strains of “Pomp and Circumstance.” There was some of the best graduation weather in years, sunny skies and warm temperatures with low humidity. Principal Ian Nevaiser welcomed the crowd by noting the 21 Region 4 school employees, both certified educators and non-certified staff, who are retiring this year. Nevaiser, who has served as principal at the high school for the past two years, is moving up to the position of assistant superintendent of schools for the district this summer. The high school will have a new principal in place when the 2010-2011 school year begins in early September. Salutatorian Chelsey Paholski of Essex noted the graduates had learned persistence and teamwork from their four years at Valley Regional High School. “Our school is unique in that it shows how three towns can coalesce to form one whole, one team,” she said. Paholski suggested the high school’s student body is a team that “works to give back to its community through service projects” such as blood drives, relay for life, and collections for community soup kitchens. Witness the range of synonyms offered, for example, by my Macbook onboard thesaurus: “very well,” “well,” “all right,” “okay”: which is a little like saying “thriving,” “healthy,” “so-so,” and “breathing, but little else” all mean the same thing. Show me a med student who maintains that “thriving,” “healthy,” “so-so,” and “breathing but that’s all,” are interchangeable descriptions of a patient’s state, and I’ll show you next week’s road crew member. Now before I am accused of advocating that kids be inculcated with the rituals of high tea at four o’clock, and the care and feeding of Granny’s bone china, allow me to explain. Or perhaps paint you some word pictures. I volunteer in an inner-city Philadelphia school built in the 1920’s. The library, where I help teach first, third and fourth graders is a relatively bright oasis of clean, sturdy tables and raspberry-hued upholstered chairs. Outside the library, strong-armed, alarmed doors keep intruders out of the sunless halls where rusty pipes often leak into containers meant for recycled paper. To many of my kids, the library can mean “fine” in the sense of an alternative: one of only a few places regularly available to them where nursery rhymes, biographies, and Harry Potter can offer beauty or delicacy in contrast to the gritty realities posed by poverty and absent parents. Since school began, though, my volunteer friends and I have been alternately surprised, bemused and discouraged by our students’ choice of books. Call it “elitist” if you will, but we can sigh when there are tug-of-wars over the “Diary of a Wimpy Kid” and “Captain Underpants” series while grade- and ability-friendly volumes featuring Martin Luther King, Albert Einstein and Anne Frank seldom get a glance. Is this “fine” in the sense of just okay (“hey, at least they’re reading”)? Perhaps. Is a steady diet of only pop culture and familiarity helping these kids to develop finer qualities like critical thinking and subtle reasoning? I think not. And lest you think that disadvantaged kids are the only ones who lack for examples of higher aspirations, come west about nine miles to the quite advantaged Main Line where the children of privilege, like their 8- to 18-year-old counterparts country-wide spend—according to a new study from the Kaiser Family Foundation—more than seven and a half hours a day in front of a smart phone, computer, TV or other electronic device. For the moment, leave aside concerns of rampant childhood obesity and the 47 percent of “heavy” media users who, according to the study, had mostly C grades or lower. “By the time he was 4, he had all these math and science DVDs…and he learned to read and do math early,” said Trey’s mother, Kim Calinan. But now that Trey is 9, Calinan observes, video games have displaced after-school activities, and her son shows little interest in any social interaction or independent exploration—such as reading—that might cut into his gaming time. And as a former communications professor myself, I can attest that even college age students, while they may be whizzes at harvesting factoids, are becoming less and less adapt at culling and discriminating between the finer points in that information avalanche. To some degree my privileged former students are no further along in their ability to engage in refined, subtle thought than my challenged present charges. So what we have here may be “fine,” in the sense of “okay” for many: Democracy is not yet threatened by many kids’ hampered ability to reason. But it is the absence of the “fine” in our kids’ lives, represented by deliberation and discernment skills, that worries me: the impetus to be curious beyond the familiar; to be enlightened beyond the obvious; to consider rather than simply emote; to be educated rather than simply amused. And absent those fine points of the human experience, we and our children are not fine at all. REGION 4– Ian Neviaser, principal at Valley Regional High School for the past two years, has been named as the new assistant superintendent for Region 4 schools. Nevaiser, 37, was formally appointed to the position on a vote of the Supervision District Committee at a meeting Thursday. He assumes the new job on Aug. 1. Neviaser replaces Diane Dugas, who resigned in May after about nine months in the job. Nevaiser becomes the third assistant superintendent for Region 4, a position that was created in 2006 during the tenure of former Superintendent of Schools Kim Caron. The district’s first assistant superintendent, Ruth Levy, replaced Caron as superintendent of schools last June. Levy said the position was posted internally after Dugas’s departure, and Neviaser was the only candidate interviewed by a search committee. Levy declined to comment on the circumstances of Dugas’s departure. Dugas had been hired last August after working previously as director of curriculum and instruction for the East Windsor school system. Nevaiser, an Essex resident, received his bachelor of arts degree from Wesleyan University in Middletown, and earned his master’s degree and sixth year certificate at Southern Connecticut State University. He worked previously as a social studies teacher, department chairman, and assistant principal at Guilford High School. He assumed the principal job at Valley Regional High School in the summer of 2008. Levy said a search committee comprised of administrators, teachers, parents, and school board members would begin reviewing applications this summer for the now open principal job at Valley Regional High School. She said a new principal would be selected before the start of the 2010-2011 school year in early September.